Even Republican Gov. Scott Walker of Wisconsin thinks the Senate repeal/replace bill is wrong-headed. Walker's negative reaction, from an arch conservative's perspective, might have some influence on Wisconsin's arch conservative Republican Senator Ron Johnson, who so far says he's undecided on how he'll vote. Republican Gov. Matt Bevin of Kentucky attacked the new Senate bill from the right. He's mad because Senate Majority Leader Mitch McConnell didn't eliminate two taxes on high earners. He huffed and puffed and claimed that there had been an “understanding that those two taxes were going to be gone.” Bevin is following the lead of Kentucky Sen. Rand Paul, who's already announced that he'll vote no. Plus Bevin has no love for Mitch McConnell, against whom he ran as a Tea Party insurgent in the 2014 Republican primary. VP Mike Pence showed up at the National Governor's Conference and hilariously extolled the McConnell bill as "a rescue mission," even as he "also acknowledged that the proposal would significantly change the population that receives health care coverage through [Medicaid]." Hypocrisy watch! Pence, while he was recently governor of Indiana, accepted an expansion of Medicaid under Obamacare. 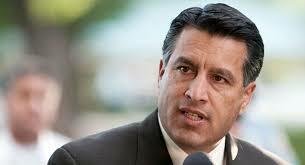 The governor who possibly holds all the power in the ultimate defeat of the new Senate bill, Republican Brian Sandoval of Nevada, remains steadfastly opposed, despite heavy lobbying from Trump himself, who apparently called Sandoval to pressure him to get his Republican Senator Dean Heller off the fence to support the bill. Sandoval and Heller stood together in opposing the first version of the bill. Perhaps phone calls from Trump aren't having the desired effect any more (if they ever did), because the president obviously doesn't even understand what's in the bill, what its effect will be, or what he promised earlier that the Senate's repeal/replace law will directly contradict. Who cares what Trump wants? He's an idiot on policy. T-rump's fans won't really feel the pinch of this terrible (but so cleverly written) bill until after they re-elect the Congressional majority in 2018 and him in 2020. With their massive tax cuts the rich will continue to buy Congress, and the census that year will give GOPers a permanent gerrymandered lock on power. They can confirm more justices like Gorsuck who will roll back every piece of progressive legislation passed since the days of William McKinley. When McConnell finally dies in office at age 98 or so and lies in state in the Capitol Rotunda, President Cruz and vice-president Ryan, everyone in Kentucky, and the few remaining news media will eulogize him as being the greatest statesman of our time. We are doomed.